The Founding Fathers had a healthy fear of government power. They relied upon citizen juries to check that power. The suspension of jury trials was one of Declaration of Independence grievances against King George. The Constitution’s 7th Amendment reflects colonial history and beliefs. 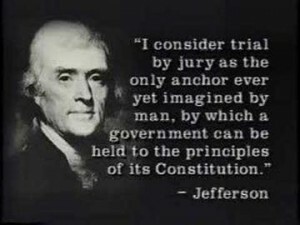 The original Constitution contained a provision for jury trials in criminal cases in Article III, section 2, clause 3, but no provision for jury trials in civil cases. During the ratification debates, the Constitution’s opponents pointed out this deficiency, and its proponents promised the First Congress would propose an amendment to address this issue. In 1789, James Madison introduced 12 amendments to fulfill the promise. Ten were ratified in 1791 becoming the Bill of Rights. The Seventh Amendment guaranteed the right to a jury trial in federal civil cases. Unlike state courts of which are courts of general jurisdiction, federal courts have limited jurisdiction. The Constitution lists specific types of cases that federal courts may decide, and gives Congress power to assign other areas of law to federal courts. The Seventh Amendment applies to lawsuits a federal court may hear under a constitutional or congressional grant of jurisdiction. Civil cases settle disputes between private parties and claims for money by citizens against the government or by the government against citizens. Money damages are the primary remedy in a civil suit. The Seventh Amendment guarantees a jury trial in Federal Court in civil cases. It does not apply to civil cases in state courts. Criminal trials determine if an individual has committed an act prohibited by law and are prosecuted by the government. Criminal penalties may include money damages (fines), and a range of restrictions upon freedom. A case is considered criminal if the possibility of imprisonment exists. The Constitution organized the government, providing power to act in certain areas and restricting actions in others. Common Law was inherited from England and remained in effect after the Constitution was adopted. Common Law defined the types of cases decided by juries, and reserved other cases for judges. The Seventh Amendment recognized this distinction. Decisions reserved for judges were considered a different area of law, known as Equity. These types of cases included areas where parties were ordered to do or refrain from doing something (an injunction). Equity covered other issues including Family Law and Probate. The guiding force for the judge under the Rules of Equity was to be fair and just. Most areas of what was formerly known as Equity have been addressed by statute, but remain assigned to judges, not juries, for decision. The jury’s Common Law role was to determine the facts of a case, by deciding what evidence was believable. The Seventh Amendment preserved that role, and that basic principle remains in place today. At Common Law, judges were able, in extraordinary circumstances able to set aside or modify jury decisions and that legal authority continues to exist today as well. The jury decides the facts of a case and makes a decision based upon the law. The jury is instructed on the law by the judge and they are to apply the law to the facts. While in civil cases a judge may modify a jury’s verdict, in a criminal case, a jury verdict of “not guilty” cannot be altered by the judge in keeping with the Fifth Amendment guarantee against double jeopardy. A “civil” trial is generally one to resolve disputes between individuals. These trials are to settle matters of disputes about a contract or if a negligent act has caused injury to another party. One of the other two not ratified in 1791 was ratified in 1992, becoming the 27th Amendment. This means a state court may hear any type of case, though state laws typically divide their own courts by different subjects such as traffic, misdemeanor, felony, domestic relations and other specialized matters. This allows judges that hear those cases to develop expertise in that specific area of law. This means a federal court may render judgment on only limited areas of law. Article III, sec. 2: “The judicial power shall extend to all cases, in law and equity, arising under this Constitution, the laws of the United States, and treaties made, or which shall be made, under their authority;–to all cases affecting ambassadors, other public ministers and consuls;–to all cases of admiralty and maritime jurisdiction;–to controversies to which the United States shall be a party;–to controversies between two or more states;–between a state and citizens of another state;–between citizens of different states;–between citizens of the same state claiming lands under grants of different states, and between a state, or the citizens thereof, and foreign states, citizens or subjects.” The provision regarding between a state and citizens of another state has been changed by the Eleventh Amendment. The Constitution and Congress grant federal courts power to decide cases about particular subjects. This is referred to as “subject matter jurisdiction”. In certain cases a court may order someone to do or refrain from doing something. This is an injunction. Federal courts are limited to hearing civil cases to specific situations. When a legislature passes a law (statute) on a subject, that law takes the place of the judge made “common law”. Juries are told to follow the law as the judge gives it to them, but juries retain the power to decide a case contrary to the judge’s instruction. This is referred to as “jury nullification”. Though a judge may find a criminal defendant “not guilty” even after a jury has returned a guilty verdict. This is very rare but is legally permissible.